She found all of them had significantly improved communication skills. They also had better problem-solving skills and reduced behavioural problems. Unfortunately, not all autistic children receive treatment in Nova Scotia which uses an immoral lottery system to determine which children receive treatment. The Nova Scotia government has no plans to expand the program to include all autistic children who require treatment. Conor visited the pediatrician today for a review. No pressing health issues; Conor just hadn't been to see him for awhile. While we waited for the doctor an assistant measured Conor's weight, 134 lbs, and height 5 feet 8 1/2 inches. Conor's autism issues have been a challenge. But he has been blessed with excellent physical health and likes to keep moving. Over the last year he has had a major growth spurt. 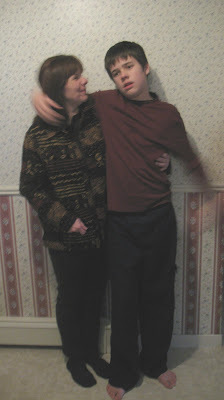 Mr. Long, Lean and Lanky is about 2 inches taller than Mom. The COMMUNITY AUTISM CENTRE INC.
Autism Centre for 7 years . In commenting on autism issues in the context of American politics I can only do so as an outsider, a Canadian with no vote, but keenly aware that American events can have a dramatic impact on Canada. I have followed American presidential elections closely since my grade 3 teacher put pictures of President John F. Kennedy on our classroom bulletin board and I remember hearing the horrific news of his assassination one year later. I am heavily biased toward the Democrats, and admire many of them - Ted Kennedy, Bill Clinton, Hillary Clinton, Joe Biden, Bill Richardson, Al Gore and Barack Obama. I still can not believe that Al Gore did not win in 2000. "There are a lot of wasteful expenditures in the federal (government)," Palin said. "Let's get rid of those and put them into strengthening NIH (National Institutes of Health) and these other areas where we can help our kids with autism." "Here's the difference between John McCain and our ticket and Barack Obama and Joe Biden," she said. "We don't just talk the talk, we walk the walk. And that's why in not just that first speech, but in every speech I give, I talk about being an advocate and a friend in the White House for our families who have members who have these special needs." The WKNV online reports that Governor Palin did not indicate what expenditures would be cut and what autism programs would be funded in a McCain-Palin administration. Stating over and over that you are an advocate for autistic persons appears to be a clear example of talking the talk but does not demonstrate that Governor Palin is prepared to walk the walk as she claims. As the report indicates Governor Palin has no actual plan for how to help autistic persons and their families. 1. Appoint Federal ASD Coordinator to Oversee All Federal ASD Efforts. 2. Fully Fund the Combating Autism Act and Federal Autism Research Initiatives. 3. Support Special Needs Education for Children with ASD. Senator Obama, not Governor Palin, appears ready to walk the walk to help autistic persons and their families. Here in Canada it is not clear if Stephen Harper has even uttered the word "autism". The sweater PM has made it clear that a Harper government will do nothing to address Canada's autism crisis. Hopefully, if Senator Obama's historic presidency does come to be, he will have some positive influence on our Canadian Prime Minister with respect to autism issues. On autism issues Canada is still looking for The Change We Need. "In the past we had children undiagnosed in general education, coping or diagnosed incorrectly without the support needed," says Palm Springs Unified Schools District's Autism Specialist Sally Talala. Entering into a traditional classroom isn't for every child with autism. Specialists say it takes a team approach to find out what is best for each individual. The assistance team is growing. Parents, schools and specialists work together to place each child in the right class for their specific needs. They take a look at social skills, communication and behavior, integrating those with more mild cases. Here in New Brunswick, in recent years, much has been done to further the education and well being of autistic students. Teacher assistants and resource teachers have been receiving autism specific training through the University of New Brunswick College of Extended Learning Autism Intervention Training Program. The autism specific training has helped provide many autistic students receive a real education. Some autistic students can receive their education in the classroom for all or part of the day. Some of our schools have also begun to accommodate the needs of those autistic children, like my son Conor, for whom education in the general classroom for most of the day is an overwhelming, counterproductive and even harmful experience. They are taught in smaller, quieter, less busy areas where they can receive one on one instruction, by autism appropriate learning methods and with a curriculum suitable to their development level. They are also brought into the mainstream classroom for brief periods for activities within their individual ability ranges. Despite this progress there are those in New Brunswick who insist that the mainstream classroom is the right place for all students. Their intentions are noble but their understanding of autistic children is lacking. Their beliefs are part of a philosophy of total classroom inclusion for all students that has dominated the New Brunswick education system for the past thirty years. The recent efforts to accommodate the needs of autistic students has been met with determined resistance by the total inclusion advocates who include the current Chair of the New Brunswick Human Rights Commission who was instrumental in promoting New Brunswick's total inclusion philosophy, the Executive Director and other representatives of the New Brunswick Association for Community Living, and some senior Education Department officials. Despite the efforts of these very influential, well connected advocates of total mainstream inclusion progress has been made. There are people in government, in the Department of Education, school districts and schools who have made decisions in the best interests of autistic children notwithstanding pressure from the total inclusion advocates. Hopefully those autistic children who can learn in the mainstream classroom will continue to be educated there while those autistic children for whom the mainstream classroom is not appropriate will continue to be accommodated in learning environments suitable for them in light of their autistic conditions. Hopefully the best interests of autistic children will continue to prevail over the rigid philosophical beliefs of the total mainstream classroom inclusion advocates. The New York Times has published in its print and online editions a lengthy piece by Melissa Fay Greene promoting DIR/Floortime. The article acknowledges to some extent the value of ABA as an autism intervention but implies that ABA is outdated and that DIR/Floortime is a new modern improved form of autism intervention. The usual cliches about ABA being rote learning are trotted out along with the positive buzzwords used to promote DIR/Floortime "relationship", "respectful of the child". The article indicates that experts do not endorse any one method. What the article does not do is mention the fact that there is no empirical evidence to support the effectiveness of DIR/Floortime as an autism intervention. The MADSEC Autism Task Force Report (2000 rev. ed.) described DIR Flootime as without scientific evaluation of any kind. effectiveness for children with autism. effectiveness for children with autism. Researchers should consider investigation using research protocols. Professionals considering Greenspan’s Floor Time should portray the method as without peer-reviewed scientific evaluation, and should disclose this status to key decision makers influencing the child’s intervention. social skills, communication skills academic performance, and overall cognitive functioning. magnitude of gains, all have demonstrated long term retention of gains made. analysis should portray the method as objectively substantiated as effective. Methods of applied behavior analysis should be considered to evaluate the effectiveness of any intervention used to help individuals with autism. Researchers should continue to vigorously investigate behavioral intervention as the most promising area of research and treatment benefitting individuals with autism known today. Early interventionists should leverage early autism diagnosis with the proven efficacy of intensive ABA for optimal outcome and long-term cost benefit. The New York Times is still a news source of great influence. When it is using that influence in promoting interventions for children with autism, a neurological disorder, it should do its homework and present an accurate and credible review of the professional literature. Simply offering a guest column to a promoter of an intervention lacking in empirical verification of its effectiveness does a disservice to autistic children whose decision makers, family or public, could be misled by the NYT and its weighty reputation. Another Autism Society New Brunswick AGM has come and gone. Turnout was low this year. But those who attended were very interested in autism in New Brunswick, asked good questions and offered valuable insights. The afternoon sped by quickly. near the end of the meeing. ASNB veterans Albert & Dawn Bowie enjoy the day. offering my two cents worth. autism issues in New Brunswick.